In a city like Los Angeles, the night is defined by its stars. It is ironic that this means the celebrities give Hollywood all of its glamorous appeal but because of light pollution the actual celestial bodies are far out of sight. Drive up past Hollywood Blvd, with its streets lined with neon signs and blinking billboards, and into the hills, you can look down at all of Los Angeles. Below a person can see small twinkling lights stretching out for miles, all distributed evenly into intersecting rows. Looking at this organized chaos can be a calming experience. As such, it seems fitting that two artists that have made use of light as an art form are simultaneously showing in Los Angeles. First is Erwin Redl, a contemporary artist who creates massive LED grid structures that resemble the byzantine systems that make up city streets. 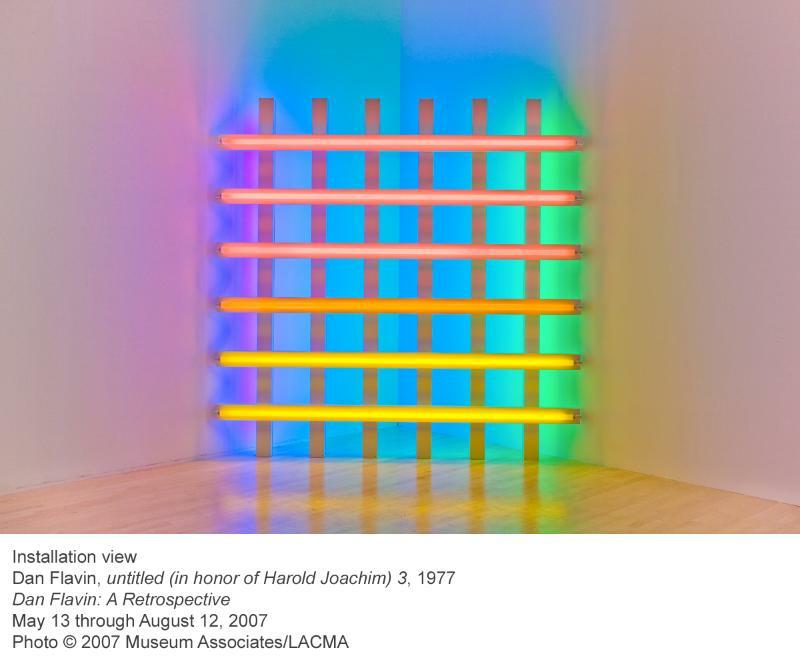 A few minutes away at LACMA is the Dan Flavin retrospective, who many consider a pioneer in the use of light as art. Both artists take light, a material that is either unerringly precise or completely intangible and amorphous, and create organized systems that completely transform the environment in which they are displayed, albeit to different effects. Stepping into Ace Gallery, one is greeted by a series of works on paper, some of which are just evenly spaced holes in water color paper. The pieces are incredibly simplistic, and seem very humble compared to the reputation that precedes the artwork that Redl is known for. Hiding behind the galleries front desk though is a large warehouse space holding five of Redl’s installations. The first sculpture is a large cylinder which is an arching drape of tiny red lights, each an eighth of an inch across. No matter what a person's interest is in art you cannot help but feel overwhelmed by the experience. It almost seems alien with its huge glowing structure that has no end. Staring at a section of the drape it seems as if the room is starting to dim, a curious feeling considering that your eyes should be adjusting to the darkness. If you change your view you will notice that the intensity of the color slowly shifts in a circular pattern, steadily moving around the entire structure. The effect is so subtle that finally making that realization is shocking. The artist has created a total vision. In sight, you belong to the art, are inside it, nearly wrapped up in its soft red glow. Beyond this first room are four more pieces, all of which are smaller in size but equally impressive. For another installation, glow in the dark threads reach from the ceiling to the floor. Hundreds of these threads, evenly placed in a grid system, take up the entire room. Viewers are encouraged to enter the sculpture, a rare occurrence for any art going experience. Small black bands are evenly spaced out on each of the threads to create an even pattern of areas that are illuminated or blacked out. The pattern is performed on each thread with the spacing the same in each piece. Due to this light and dark pattern, shifting one's view through the forest of glowing stems is a dizzying effect of a kaleidoscopic vision before you. 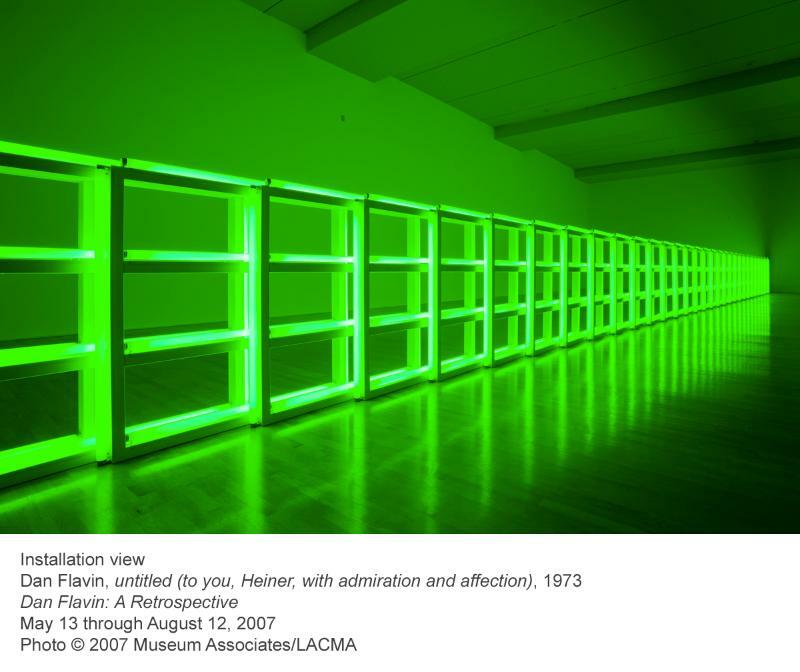 Not more than ten blocks away is LACMA and the Dan Flavin retrospective. 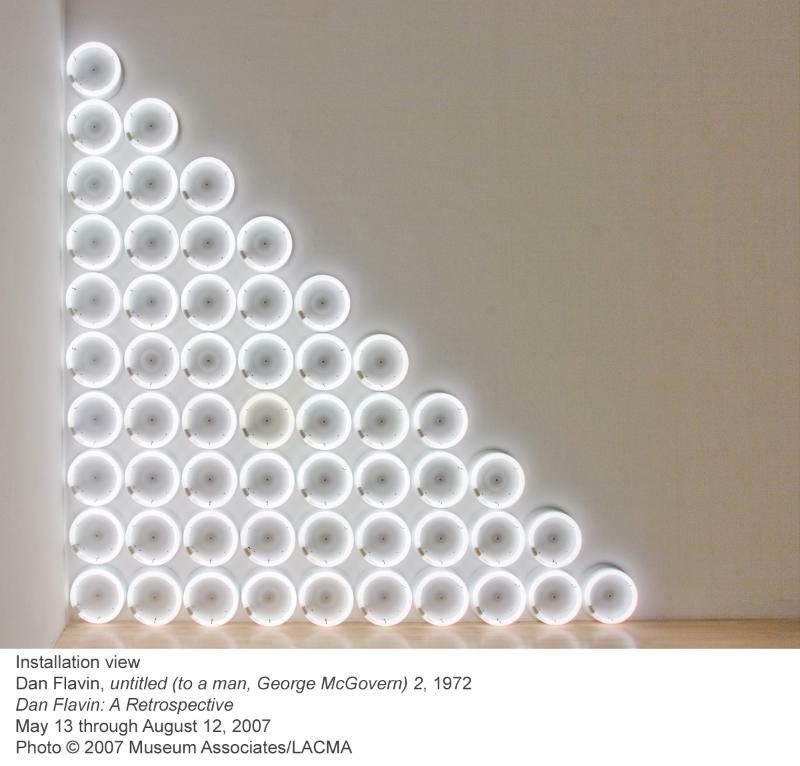 Dan Flavin originally became famous in the 1960's and is associated with the Minimalist movement. By now his work has reached iconic status as he almost exclusively uses industrial flourescent lights in varying arrangements to construct his minimalist sculptures. Where as Redl awes an audience through the epic nature, complexity and scope of his sculptures, Flavin's strength lies in how simplistic his artwork is. For pink out of a corner (for Jasper Johns) a single soft pink tube leans against the corner of a room. Flavin proves the power of his work quickly with the slightest of gestures. With an 8 foot long tube resting in a gallery corner, his art work takes control of the entire space. A simple form with such direct positioning obviously fills the space with light, but also the actual sculpture makes you aware of the negative space. A room which has exsisted for decades and exhibited some of the most important art in the world, feels as if it has existed only for right now. As you continue to walk through the exhibit, the size and complexity of Flavin’s work grows. The installations now take up large rooms with varying types of brightly colored neon lights organized into criss-crossing patterns. One impressive piece involves three hall ways, all blocked off in the middle with rows of horizontal tubes. On one side you can see yellow tubes, but beyond that blockade the hallway glows purple, as there are different colored lights on the other side. What is a small revelation in itself is shifting your focus away from the actual sculptures and to the gallery walls, which now are splashed with blue, yellow, purple and red light, all pooling together into fantastic color fields. The general ambiance wraps the viewer up in unending color. Looking back on both shows side by side, it is interesting how artificial light, produced through varying advances in technology, can make a viewer so aware of their being and humanity. 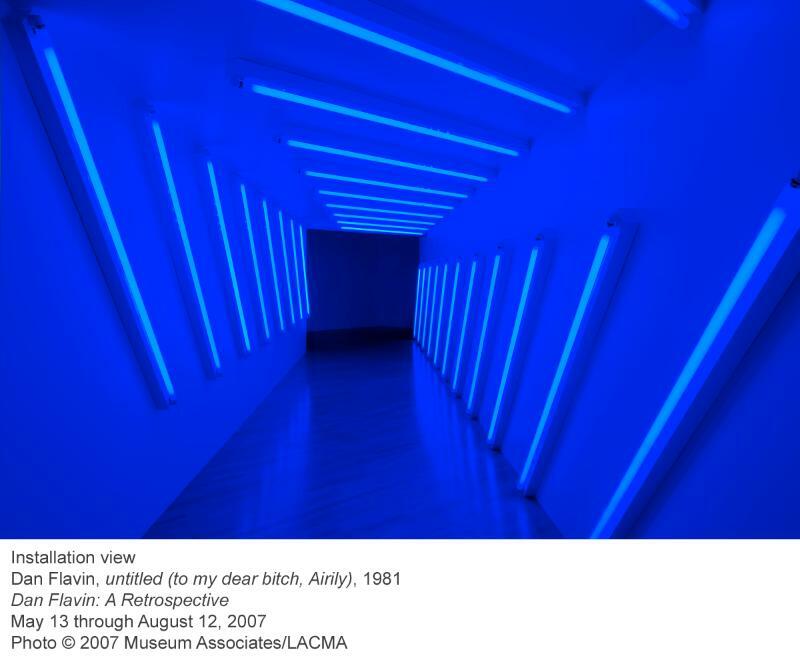 Flavin, followed by Redl, create environments that either transport you or make you extremely aware of right where you are. With darkness they create illumination on every level possible. found art, and here we are now.